Original Editors - Amanda Schoenfelder and Katie Williams from Bellarmine University's Pathophysiology of Complex Patient Problems project. Scleroderma is a connective tissue disease that involves changes to the skin, and can also involve changes to the blood vessels and internal organs. It is a chronic, progressive autoimmune disorder where inflammation and the overproduction of collagen accumulate in the body. There are two main types of Scleroderma- Systemic and Localized. Systemic Scleroderma may affect the skin and multiple systems such as the integumentary, cardiopulmonary, vascular, gastrointestinal, genitourinary, or musculoskeletal. 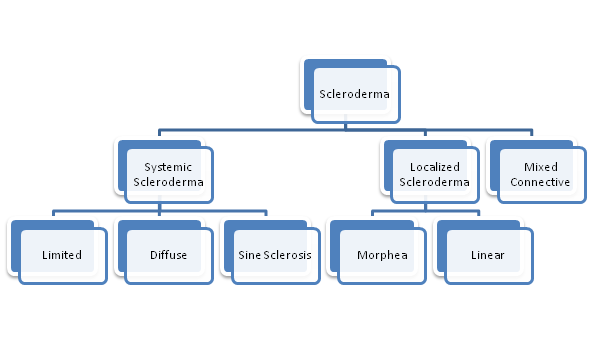 There are three forms of Systemic Scleroderma. With Diffuse Scleroderma skin thickening occurs more rapidly and involves more skin areas than in limited. In addition, people with diffuse scleroderma have a higher risk of developing “sclerosis” or fibrous hardening of the internal organs. With Limited Scleroderma (includes CREST syndrome) skin thickening is less widespread, typically confined to the fingers, hands and face, and develops slowly over years. Internal problems occur, but they are less frequent and tend to be less severe than in diffuse scleroderma. CREST is an acronym using the letters of the conditions involved; Calcinosis, Raynaud’s, Eosophageal dysmotility, Sclerodactyly and Telangiectasia. The video below gives some good examples of these. Morphea is characterized by waxy patches on the skin of varying sizes, shapes and color. The skin under the patches may thicken. The patches may enlarge or shrink, and often may disappear spontaneously within three to five years. In some, rare, cases muscle weakness may be associated. Linear Scleroderma starts as a streak or line of hardened, waxy skin on an arm or leg or on the head and neck. Linear scleroderma tends to involve deeper layers of the skin as well as the surface layers, and sometimes affects the motion of the joints, which lie underneath. Mixed Connective Tissue Disease or Scleroderma Overlap syndrome is when Scleroderma is diagnosed when another disease, such as systemic lupus erythematosus and polymyositis, has been previously diagnosed. Thirty percent of those with scleroderma have the systemic form of scleroderma. This type appears to be more common in adults. Localised scleroderma is more common in children. Race and ethnic background, may influence the risk of getting scleroderma, the age of onset, and the pattern or severity of internal organ involvement. Choctaw Native Americans and African-Americans are more likely than Americans of European descent to develop the type of scleroderma that affects internal organs. Lab tests can also confirm a suspected diagnosis. Topoisomerase-1 antibody or Scl-70 antibodies is a marker of systemic sclerosis. Not all people with scleroderma have these antibodies and because not all people with the antibodies have scleroderma, lab test results alone cannot confirm the diagnosis. A skin biopsy (the surgical removal of a small sample of skin for microscopic examination) can aid in or help confirm a diagnosis. Diagnosing scleroderma is easiest when a person has typical symptoms and rapid skin thickening. In other cases, a diagnosis may take months, or even years, as the disease unfolds and reveals itself and as the doctor is able to rule out some other potential causes of the symptoms. Currently, there is no treatment that controls or stops the underlying problem—the overproduction of collagen—in all forms of scleroderma. Treatment and management focus on relieving symptoms and limiting damage. Several different specialists may be involved in the care of one person since scleroderma can affect many different organs and organ systems. Typically, care will be managed by a rheumatologist, who may refer the patient to other specialists, depending on the specific problems they are having. Immune-suppressing medications such as methotrexate and cytoxan. Scleroderma can affect many different organs and organ systems. Additional medications are based on the symptoms that the individual experiences. 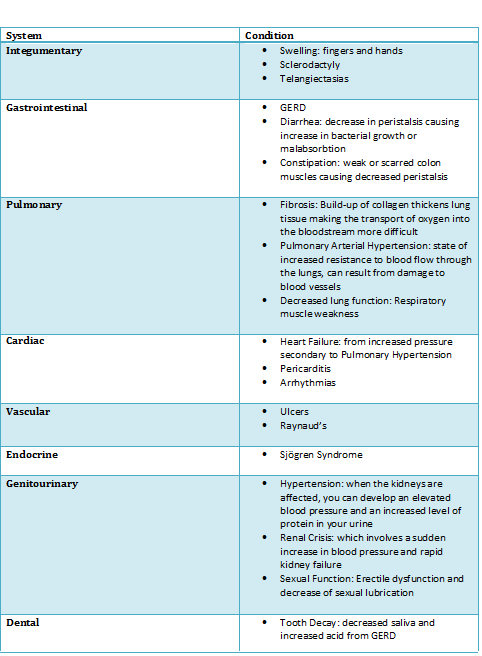 Medications to treat pulmonary hypertension include prostacyclin-like drugs, endothelin receptor antagonists and PDE-5 inhibitors. These work to open up the blood vessels in the lungs. Medications to treat Raynaud's phenomenon- calcium channel blockers, PDE-5 inhibitors to open up narrowed blood vessels and improve circulation. Other health professionals such as psychologists, and social workers may play a role in patient care. Research about the most effective management and treatment is ongoing. A number of other diseases have symptoms similar to those seen in scleroderma. Eosinophilic fasciitis (EF): This rare disease involves the fascia, the thin connective tissue around the muscles. The fascia becomes swollen, inflamed and thick. The skin on the arms, legs, neck, abdomen or feet can be involved. Unlike scleroderma, the fingers are not involved. A skin biopsy distinguishes between the two diseases. Nephrogenic Systemic Fibrosis: An uncommon disease of fibrosis of the skin and organs, caused by gadolinium exposure ( used in imaging) in those patients with renal insufficiency. Raynauds phenomena: This may occur in isolation, as well as part of the scleroderma disease process. Portal hypertensive ascites can occur in limited systemic sclerosis with positive anti-centromere antibody and respond to corticosteroid treatment.